You’ve heard several times that during the time of operation, doctor unconscious patients in order to relief them from pain! Do you know? What is the technique behind this? What that particular term is known as? The word anesthesia (also known as anaesthesia) is derived from two Greek words – “an” that means “without” and esthesis means “sensation”. It is one of the branch of Medical Courses. Definition –“Anesthesia is the temporary state of unconsciousness that can be done either through injection or by inhalation (breathing in). It numb the sensation of the patient and enables the doctors to carried out medical procedures without any pain and discomfort”. Drug that causes anesthesia is called anesthetic. The physician who performs anesthesia is called anesthesiologist (in US) and anesthetist (in UK). Anesthesia are of different types namely regional anesthesia (only makes that part of the body unconscious that is to be operated), local anesthesia (similar to regional anesthesia but it is only applied to smaller area) and general anesthesia (makes the body unconscious). Mostly, people undergoes under anesthesia during the surgical procedure or during the birth of their baby. Anaesthesia plays a very important role in the practice of medicine. Using anaesthesia during the surgical procedures has pros and cons. 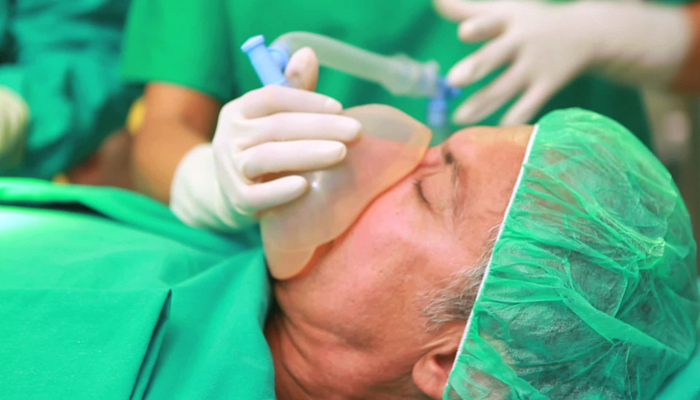 Anaesthesia enables patients to go through the operation safely without feeling any pain. It helps the anesthesiologist to carried out operation easily and efficiently. In India, there are many Universities & Institutions which offers Anesthesia Courses by providing an opportunity to the students to take up the profession of an Anesthetist & Anesthesiologist. Many Institutions offer undergraduate & postgraduate degree programme in the field of Anesthesia & Anesthesiology. Anesthesiology is the study of anesthesia and administering the same on patients, those needs surgical intervention as part of their treatment. Bachelor of Science (B.Sc) in Anesthesia: It is three year duration programme. Post Graduate Diploma in Anesthesia: The duration of this programme is two years. Students have to qualify 10+2 examination with Physics, Chemistry, Biology and Mathematics. After 10+2, students have to pass the MBBS degree from a recognized university. After completing the MBBS degree, students can apply for the postgraduate programme in Anesthesia. How to start career as an Anesthesiologist? Becoming an anesthesiologists requires good subject command in all the core medical subjects and extensive study & practical work in the subjects of Anesthesiology. Appear in Medical Entrance Examination like NEET 2019 after completion/appearing 12th Examination with science. The career of an anesthesiologist begins after gaining MBBS degree. Candidates have to earn the PG specialization in anesthesiology. Now, you will be an Anesthesiologist and can start your career. Career in Anesthesiology is one of the most useful areas in the field of healthcare. There are many job opportunities for the Anesthesiologist. They will get the employment in medical universities or schools, public sectors, outpatient care center, specialty hospital, offices of physicians. The role of an anesthesiologist is very important during the operations since any allergic reactions may occur in the patient’s body due to the effect of anesthesia. The duty of the anesthesiologist is to keep an eye on the breathing, blood pressure & heart rate of the patient. You can also work as a volunteer in any local hospitals or at a health care clinic to gain experience. The requirement of Anesthesiologists is increasing not only in India but also in foreign countries. Other opportunities may exist in military, research field, etc. After gaining experience, you can work as a teacher in the area of anesthesiology in national & international universities. Is the job of Anesthesiologist is highest paying job? Yes, definitely you will get the lucrative pay in this field. You will get the salary depending upon your experience, job location and job profile. In India, as an Anesthesiologist, you may start your career with a minimum salary of Rs 20,000 to 30,000 per month. It depends upon the medical organization you work for. After an experience, you can work on an hourly basis & earn a lucrative salary. On an average, the salary of anesthesiologist is approximately $300,000 per annum. Experience ones will receive the salary around $450,000 (excluding bonus). For more information regarding anesthesia, ask your queries below. Anaesthisia technician ki exam ki preperation kaise kre….???? please help you guys. I had completed 12th std. What is process to get admission in anathesia? Is there any government college of anathesia ? I completed my 12th.I got 97.3 percent.i am belongs to bc-b category.Will i get free seat in govt clg in bsc anasthesia???? which course is the best to chosse in paramedical courses..
How many mark is needed in 12th?and neet? shall I can do bsc anesthiology after my 12th class? What jobs I can do after this 3 year course? shall I get job after Bsc or I want to do msc degree? Is diploma in anesthesia valuable in europian countries.could I grab a job after my diploma In those countries? Yes, after your 12th from Biology subject you can go for it. Sir,i am still study in bsc Anaestheia tech…after Bsc I can study Msc is good or bad? I completed my bsc in anaesthseia technology, what are the higher studies after this?? And I wanted to joking for anaesthesiology assistant can u suggest me any good higher studies ?? Am in class 11 living in Guwahati,Assam. What should i do to became anesthesiologist pediatrician? How much years it will take? i heard a news fews days ago. That diploma in anesthesia have no value. ..right?? Or fake news??? ?